Today we're sharing our first projects featuring the Bloom Brighter stamp set and coordinating, Blooming Die Set. 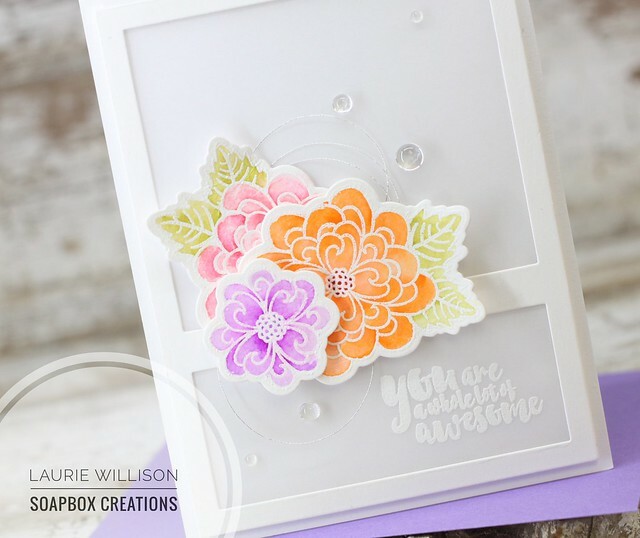 A fresh take on the flower from the retired commemorative set Beautiful You, this beautiful encouragement set is perfect for a vareity of cardmaking occasions. First, I took the card front die cut and lined it with vellum. I heat embossed the sentiment, "you are a whole lot of awesome" on the bottom panel. I added foam tape to the back of the card front to pop the vellum panel up. After I watercolored up a few flowers, I attached them, along with some silver thread, to the front of the card. I finished it off with some dew drops for a little bling. This is such a beautiful card---the design, the colors, the execution! Love the softnes and choice of colors, so refreshing! So very pretty! Gorgeous colors on those beautiful blooms. Love this gorgeous CAS card. What a gorgeous card! Love those colorful, beautiful blooms with all of that white! I so miss seeing the beautiful CAS flair you bring to Verve! This card is a masterpiece. Love the soft watercoloring and the dreamy look of the vellum panel. Exquisitely pretty! Love the sweet colors and the vellum. Beautiful work!! How gorgeous! That layer of vellum is wonderful and creates such a soft base for these stunning blooms which you have watercoloured so perfectly. This is gorgeous, Laurie, and I love the soft colors with the white and vellum! Lovely!! Hugs! Beautiful simple card--my kind of card making. Thanks for sharing. Oh, So Pretty! Inspires me to use my Zigs more! Very pretty colors and I like the use of vellum. Love that soft, pretty look, and the vellum adds to the softness of the card. Awesome combo! A beautiful card. I love the gorgeous blooms and your fab design. Very lovely and elegant card ! love this clean, crisp design!! Gorgeous!!! Your flowers are so beautiful and the layout really lets them shine! Beautiful card. I love how you used the vellum. So, so pretty. These blooms look fabulous watercolored. So pretty! Love the colors you chose for the florals and that white on white background! Wonderful card, love way you used the vellum to highlight the flowers. The blooms are awesome. Lovely card. Love this beautiful, delicate card design. The dewdrops add that extra touch of pretty! This is seriosuly stunning, Laurie! All that soft white space with the pops of beautiful flowers is amazing. And the white on white sentiment is perfect. Thanks so much for sharing your talents with us once again for this milestone release! Big hugs! Beautiful watercoloring and I love how you added vellum to the inside of the frame! Gorgeous card, Laurie! This is so pretty and soft. Love the vellum background and the way you layered and popped up the flowers.